The Roe Deer was @SpeciesofUK from 2nd to 8th June, 2014. The roe deer is a native UK deer species that nearly become extinct here in the eighteenth century. They are known for their distinctive three-tined antlers. Deer are a widespread group of mammals. Deer are the group of mammals that make up the family Cervidae. There are over ninety species of deer spread across Europe, Asia, Africa and North and South America. Deer are a type of 'ruminant', meaning they ferment plant food in a specialised stomach, regurgitate it to ‘chew the cud', then swallow it again to digest. 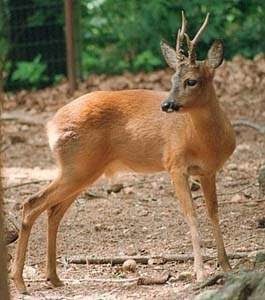 The males of all deer species (bar the Chinese water deer) grow and shed new antlers each year. This differentiates them from antelopes. 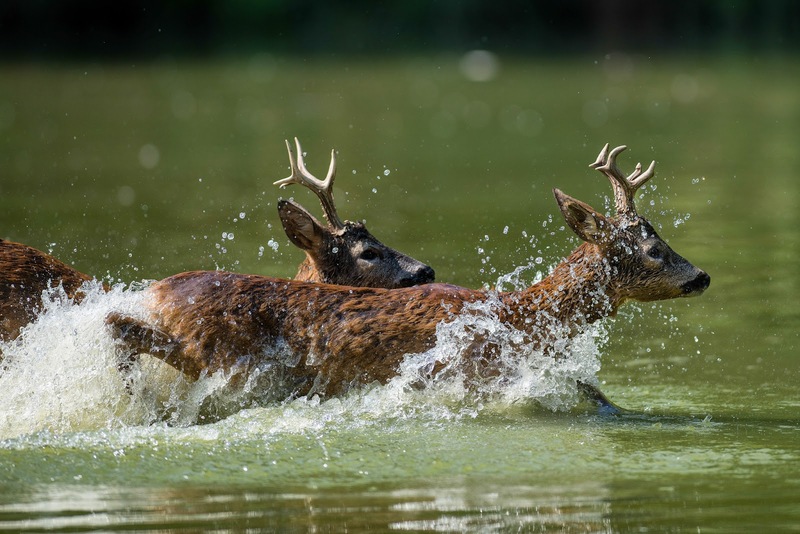 The word deer originates from Old English dēor which had a broad meaning of wild animal of any kind. The modern German ‘Tier’ still retains this sense. The adjective pertaining to deer is 'cervine' which comes straight from the Latin for deer 'cervus’. 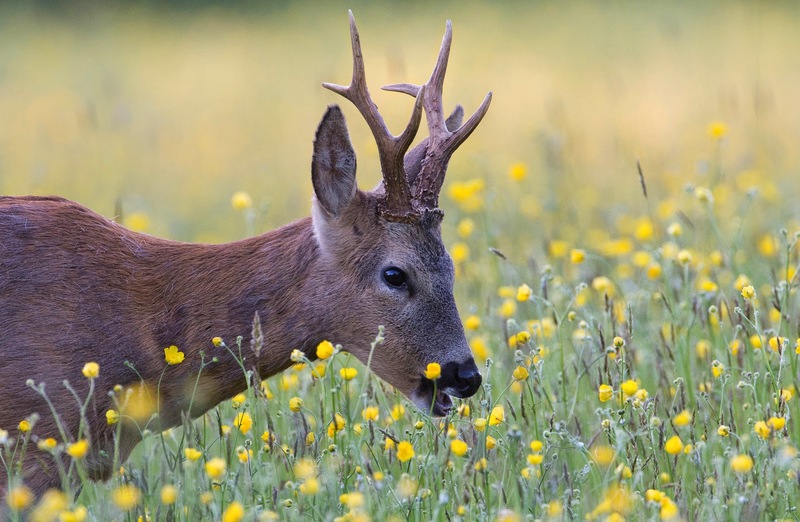 In most deer species, including the roe deer, the female is a 'doe' and the male a 'buck'. A notable exception is red deer where the male is a 'hart' or a 'stag' and female is a 'hind'. 'Venison' is the meat of a deer, although historically this word described any hunted game meat. In South Africa venison is antelope meat. 'Roe deer' itself is a very old name, deriving straight from Anglo-Saxon rāhdēor. 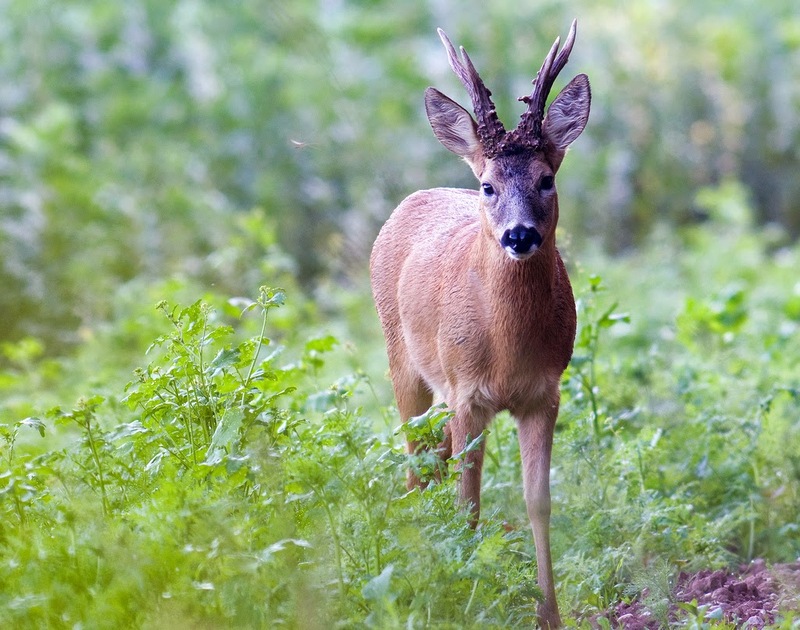 In France, the roe deer is known as 'le chevreuil’. The roe deer has a close relative – the Siberian roe deer. The roe deer, Capreolus capreolus, is sometimes called the 'European roe deer' or 'western roe deer' to distinguish it from the related and somewhat larger ‘Siberian roe deer’ or ‘eastern roe deer’, Capreolus pygargus. The roe deer and the Siberian roe deer are the only two species that together make up the genus Capreolus. The Siberian roe deer actually became briefly naturalised in England from escapees in Woburn but had disappeared by 1945. 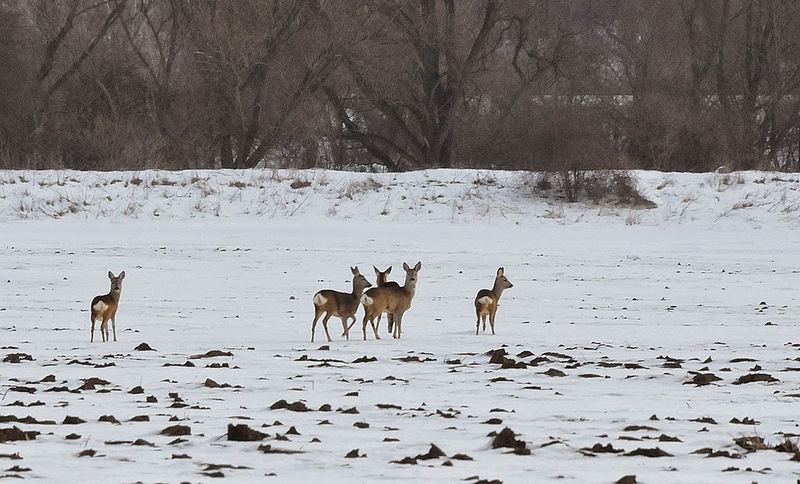 The ranges of the roe deer and Siberian roe deer meet at the Caucasus Mountains, where roe deer occupy the southern flank and Siberian roe deer the northern. 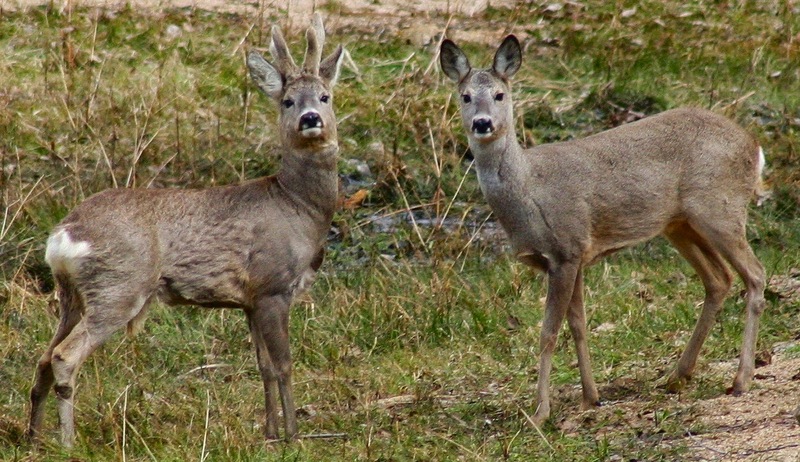 Roe deer are widespread in Europe and mainland Britain. The range of the roe deer stretches from Britain in the west to the Caucasus in the east, and from the Mediterranean to Scandinavia. The roe deer's primary habitat is woodland and forest, although they will occupy fields too when under high population pressure. 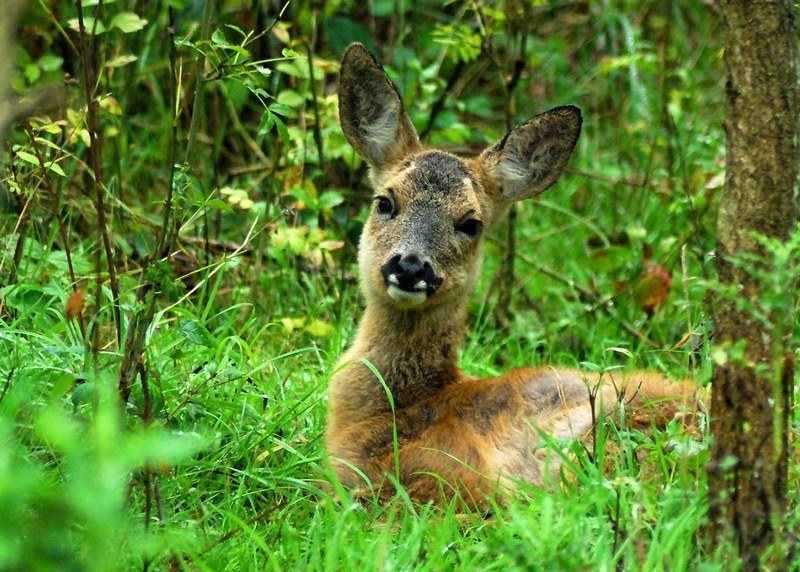 Roe deer are common and widespread throughout mainland Britain, with the exception only of parts of Kent, the Midlands, and Wales. They are native here. Evidence of their presence in Britain dates to before the Mesolithic period. However roe deer nearly became extinct in Britain by 1800. They were wiped out in England by forest clearing and hunting and survived only in woods in Scotland. Roe deer have recovered remarkably since then. 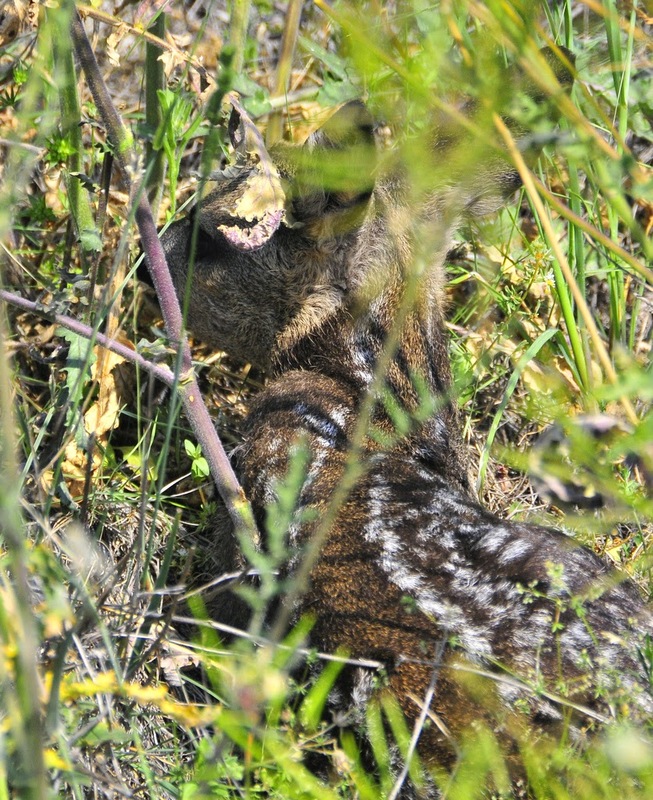 The Victorians performed several reintroductions, habitat has recovered and hunting is more controlled. Today, roe deer are very widespread and abundant. There are now an estimated 500,000 individuals in Britain. Roe deer are small and elegant. When adult roe deer vary from 10-25kg in weight and 60-75cm at shoulder. Bucks are slightly larger than does. This makes the roe deer relatively small compared to our other deer. They are bigger than muntjac but smaller than red, fallow and sika deer. Roe deer have black noses and white chins. 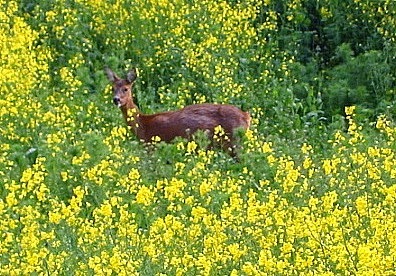 In summer the roe deer is golden/reddish brown in colour. 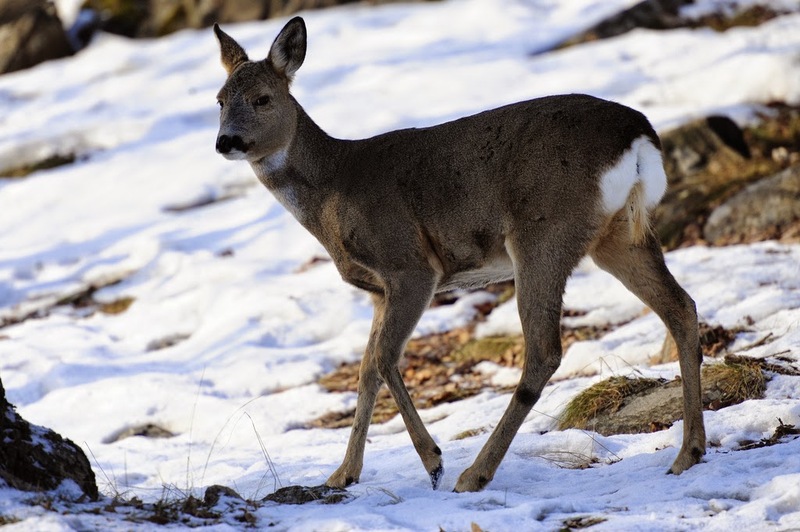 In winter, the roe deer darkens to grey or pale brown, occasionally even black. The coat can be also flecked with yellow. 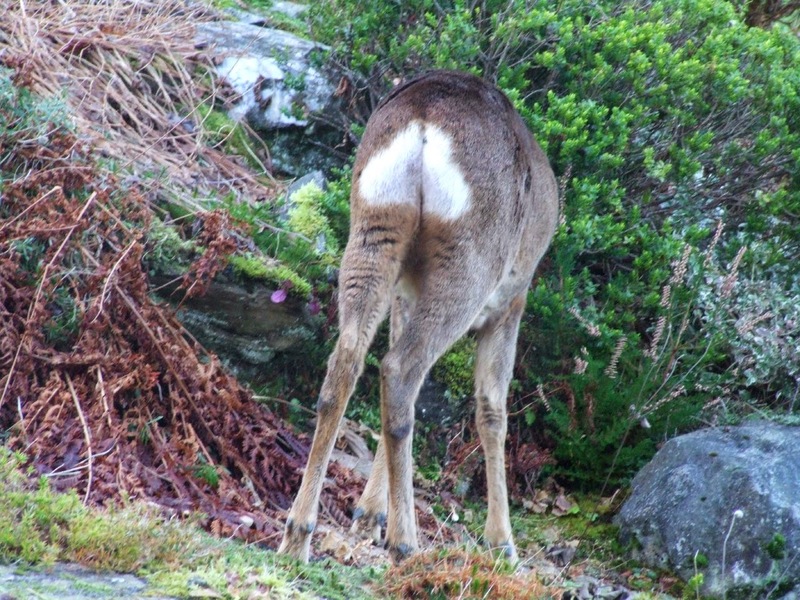 Roe deer have a white rump patch with a very short (2-3cm), barely visible tail. This can help distinguish them from other deer species which have more obvious tails. The roe deer rump patch expands to form a large disc when they are excited or alarmed. A few years ago BBC Springwatch produced a definitive guide to deer backsides which you can still see here. Roe deer bucks have distinctive three-tined antlers. Roe deer antlers are ‘rugose’ (rough, wrinkled and bumpy), short (less than 30cm long) and with three ‘tines’ or points on each. Only the bucks (males) have them. The roe deer buck's first and second sets of antlers are short and unbranched. 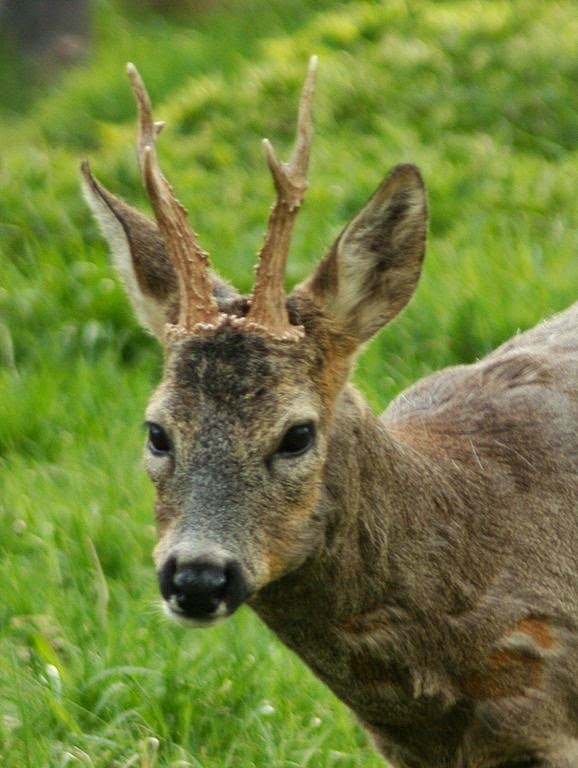 Older roe deer bucks develop antlers around 25cm long with three points (rarely even four). Roe deer begin to grow their antlers in November. Initially they are covered in velvet-life fur which later disappears when the hair's blood-supply is lost. Some roe deer bucks actually rub their antlers on trees to get rid of the hair more quickly and get their antlers read for duels during the rut. After the rut, bucks shed their antlers in October and begin to grow a new set. Roe deer are unusual in that their antlers begin re-growing almost immediately after they are shed. Roe deer are herbivorous browsers. Roe deer actively select a range of foods that include herbs, brambles, tree shoots, heather and more. 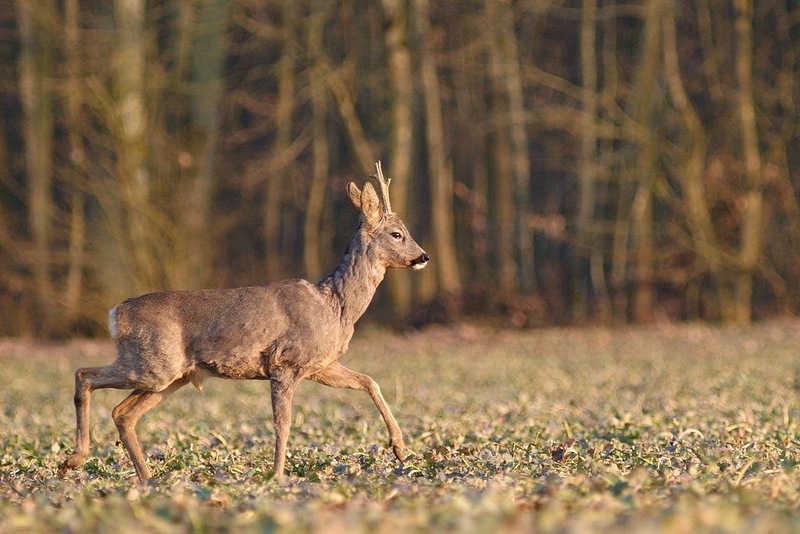 Peak times of activity for roe deer are dawn and dusk. They can be active however at any time of day or night. Roe deer spend a lot of time 'lying up', which simply means lying down between feeding to ruminate (bring up and chew their food). Roe deer are solitary animals for most of the year, apart from winter when they can form small groups. 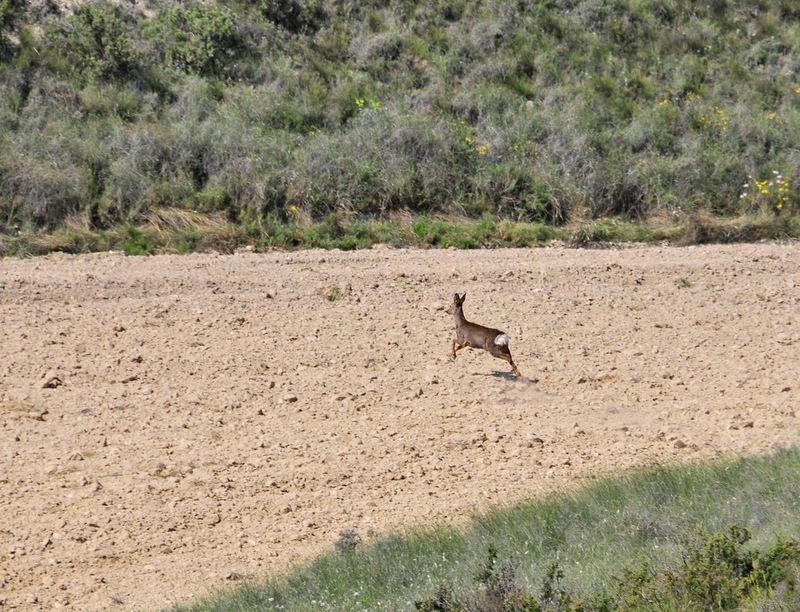 When alarmed roe deer will quickly move away from danger with a bounding gait. Both sexes of roe deer have a short bark, which they can repeatedly use when alarmed. Roe deer bucks become aggressive during ‘the rut’. The roe buck establishes his territory quite early in the year - from the end of April to May. 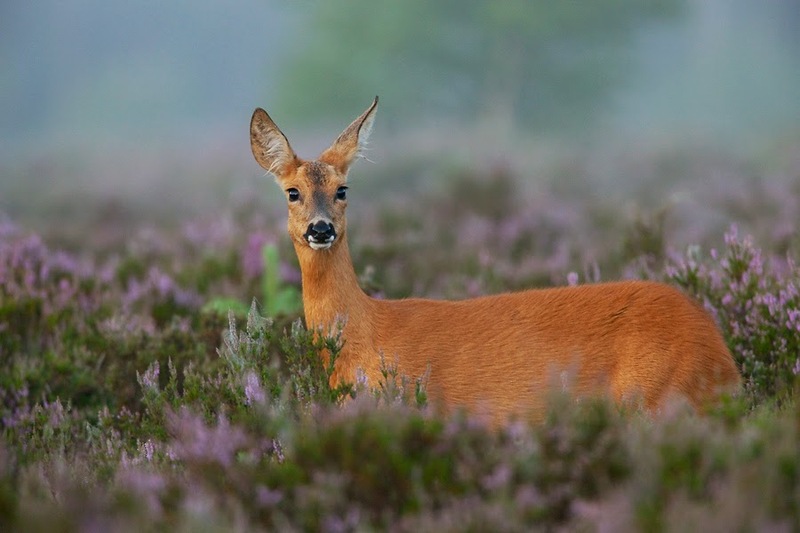 The roe deer breeding season occurs from the middle of July to the middle of August. It's called 'the rut'. During the rut, roe deer bucks become aggressive. They secure exclusive territories around one or more does. Roe deer bucks fight over these territories during the rut. The fights are violent and can even result in serious injury or death. Roe deer does don’t stay in exclusive territories unlike the bucks. They have overlapping home ranges. During the rut, roe does make a high pitch piping call. This attracts the buck who responds with a rasping noise as they court. Roe deer courtship involves the doe chasing away from the buck for several minutes, until she decides she's ready to mate. Roe deer bucks will mate with several does. Does will also sometimes mate with more than one buck. Roe does give birth to two or three ‘kids’. Roe deer practice 'delayed implantation’. This means mating occurs in August but the fertilised egg does not implant until January, to avoid winter births. 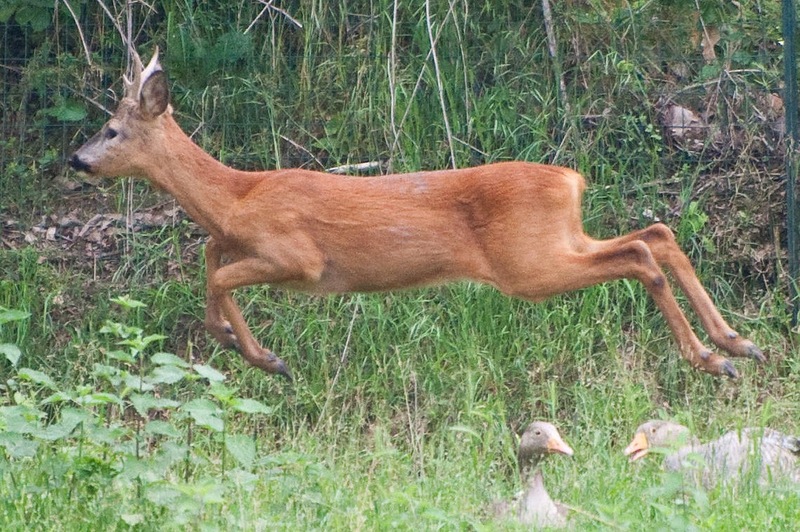 The roe deer is the only hoofed animal in which this delayed implantation occurs. 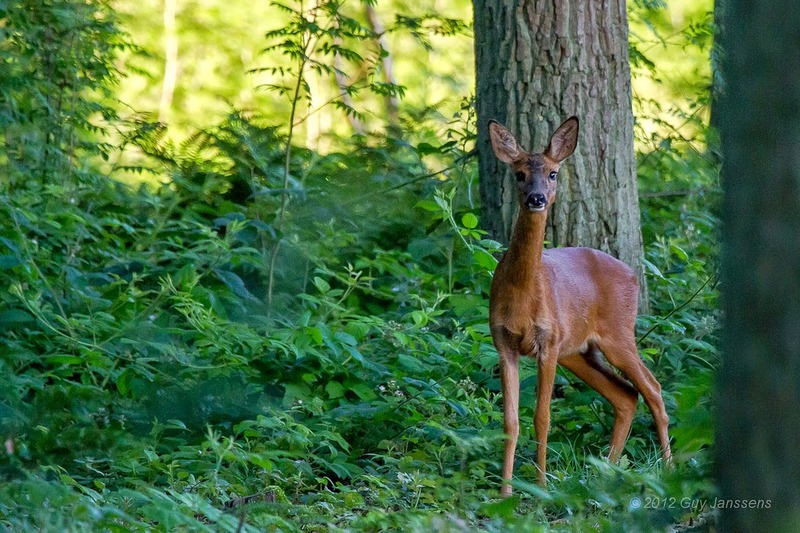 After a gestation period of nine months (four months before implantation and five after), the roe doe gives birth in May or June, usually to two kids or sometimes to three. 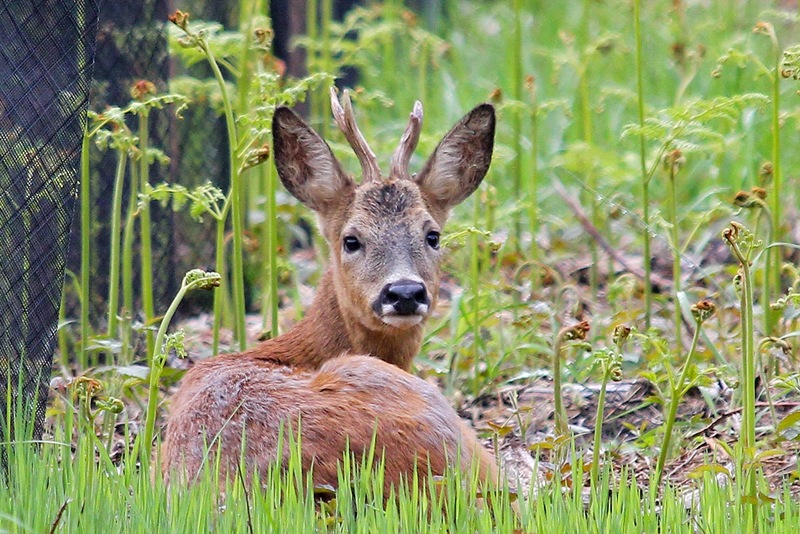 Newly born roe deer kids can be seen lying close among bracken, bramble or grasses, often left temporarily by the doe. 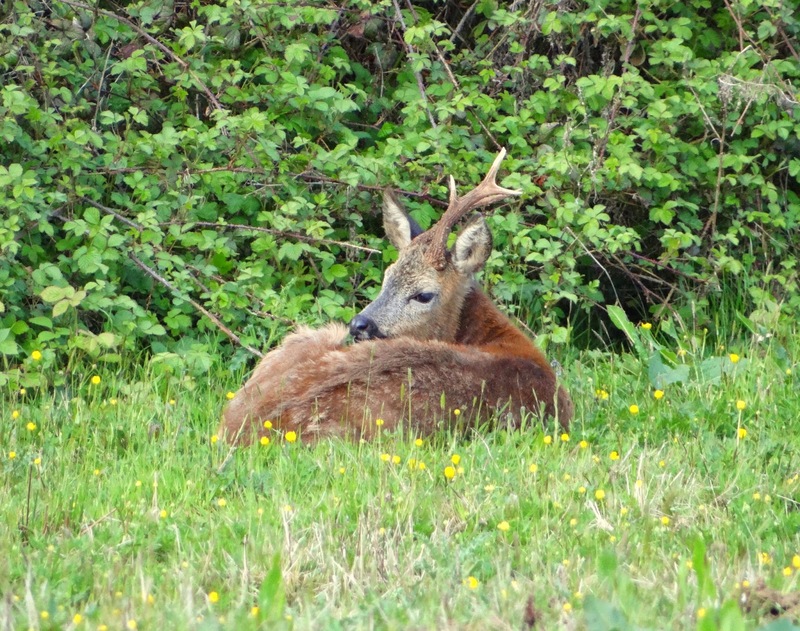 Roe deer kids have spotted coats which helps them remain camouflaged while lying low. The roe doe will not stray too far from its kids and will return to suckle them several times a day. Roe kids can suffer heavy mortality early in life - shortly after birth and during their first winter. 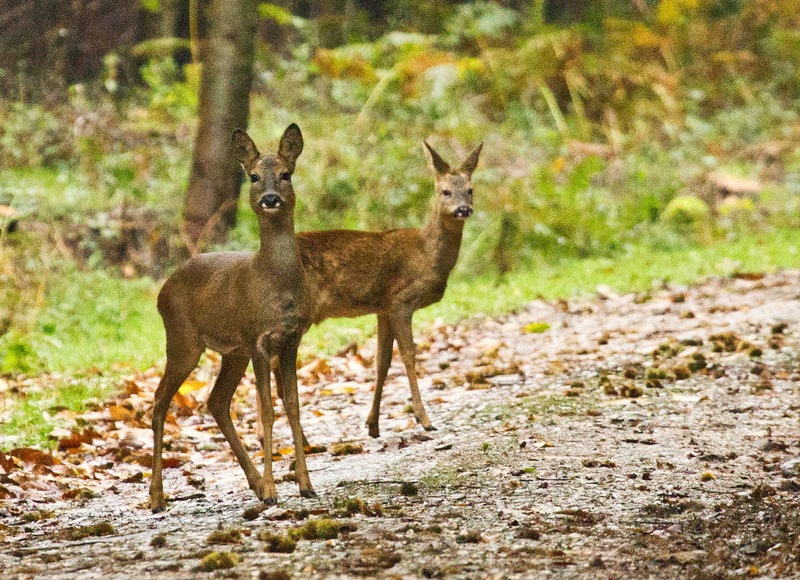 Roe deer populations in the UK require careful management. Roe deer get into conflict with farmers and foresters because they browse the shoots of trees and agricultural crops. However, roe deer also bring economic benefit to country estates who use roe deer for recreational stalking and/or venison supply. Roe deer are responsible for the greatest venison income in Europe. 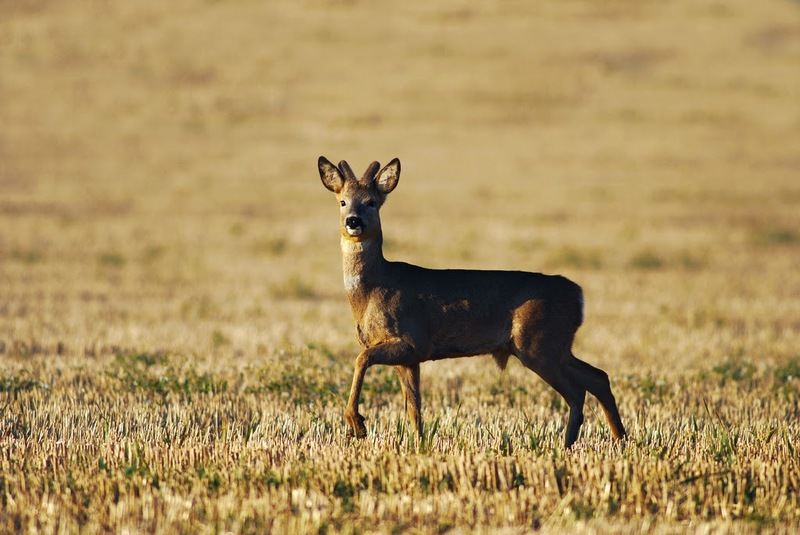 The reality is that the roe deer, like all UK deer populations, requires careful management because their natural predators, such as wolves, aren't present here anymore. Despite being present across most of Europe, roe deer have never been known to occur in Ireland.